Mars Life Hunt: Could Basin Host Remains of an Ancient Biosphere? 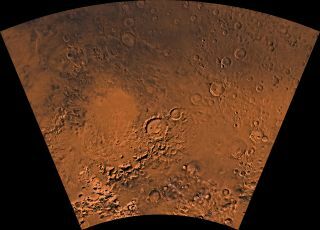 The Argyre basin region, a rim of rugged mountains surrounding a nearly circular expanse of lighter plains, is visible in the center-left portion of this image by NASA's Viking 1 orbiter. An enormous basin in the southern hemisphere of Mars might be the best place to search for signs of past and present Red Planet life, a new study suggests. The Argyre basin contains a wealth of ingredients thought necessary for the evolution of life, and should be a prime target for a series of future Mars missions, study team members said. "This large collection of special features all together in the same setting, accessible by a single mission, is what makes Argyre unique," he said. An image of the Argyre impact, as seen in 2006 by NASA's Mars Reconnaissance Orbiter. The Argyre impact basin lies at about 50 degrees south latitude. Sunlight is hard to come by during the winter months in locations so far from the equator, so long-term missions might need to rely on nuclear power, as NASA's Mars rover Curiosity does, researchers said. A solar-powered mission could still conceivably work, just for relatively short periods. In 2008, for example, NASA's Phoenix lander operated near the Martian north pole for 157 Martian sols (the equivalent of 161 Earth days — one Martian sol lasts about 24 hours and 37 minutes). Despite the challenges, the potential scientific rewards make Argyre a compelling place to explore, study team members said. They suggested a multiple-mission approach, beginning with an orbiter combined with aerial platforms, followed by one or more rovers. These rovers could bear miniature landing science stations and autonomous drilling equipment that could search for signs of past or present Mars life. "I would like to have a true life-searching payload to inspect the astrobiologically promising features," Fairén said. "Argyre could be safeguarding the latest remains of an ancient Martian biosphere." Four billion years ago, liquid water was plentiful on the Martian surface. The planet likely harbored an enormous ocean and craters filled with lakes. A thick atmosphere surrounded Mars, shielding it from radiation and possibly nourishing life. Around this time, a massive space rock slammed into the planet's southern hemisphere, excavating the 1,100-mile-wide (1,800 kilometers) Argyre basin. This collision also created rim-based mountains, broad ridges and valleys nearby, researchers said. Mountains covered with carbon-dioxide frost surround the outer edges of the Argyre basin in this image captured by NASA's Mars Global Surveyor image. The impact may have helped to spread water and other life-supporting material from the crust to the surface, potentially creating a massive lakewithin the basin. Furthermore, when combined with activity from nearby volcanoes, energy from the impactcould have helped to drive hydrothermal activity near the basin. Previous studies suggested that, at some point after the impact, Argyre basin contained a large body of water that could have been the source of the river that shaped the adjacent Uzboi Vallis. But Mars has changed greatly since those early days. The planet lost much of its atmosphere to space and grew considerably colder as a result. Lakes and rivers froze, creating glaciers in southern Argyre and the nearby highlands. Observations from various NASA Mars craft — including the Viking missions, Mars Global Surveyor, Mars Odysseyand Mars Reconnaissance Orbiter— have helped to map the evolution of the region, revealing signs of continent-size glacial activity and geologically recent resurfacing. Water was likely even more abundant in the Argyre basin region than in Gale Crater, the 96-mile-wide (154 km) impact crater in which Curiosity touched down, Fairén and his colleagues said. Small mounds that lie near Argyre could be evidence of ancient pingos, chunks of ice fed by underground water systems, the researchers said. The ice may have served to buffer liquid water, keeping it around for longer periods of time than would otherwise have been possible and creating stable environments that could last long enough for life to evolve, the scientists said. A region like these where ice and rock interacted "would be a very interesting environment for the development of microbial life," Fairén said. Martian life-forms might even exist beneath the surface today, study team members said. While the surface environment of ancient Argyre could have been an ideal place for life to thrive, conditions there were likely also excellent for preserving fossils. The authors said the minerals formed by water could have rapidly entombed cellular structures, sheltering them over the eons. "Argyre's unique geological setting may have contributed to the existence of life and may have significant implications for the search for life on Mars," the authors wrote in their article, which was published in the journal Astrobiology.